Weld preheating is the process of heating the base metal (parts to be welded) to a specific temperature prior to welding. The specific temperature to which the part needs to be heated (before welding) is referred to as the “preheat temperature”. The area requiring preheat may be the whole (entire) part, or just the area immediately surrounding the weld. Preheating may continue during the actual welding process, but many times the energy generated from welding will be sufficient to maintain the desired temperature. The temperature of the weld between the first pass and the last pass is referred to as “interpass temperature”. As long as it can be assured that interpass temperature will not fall below the preheat temperature, continued preheating is usually not required. 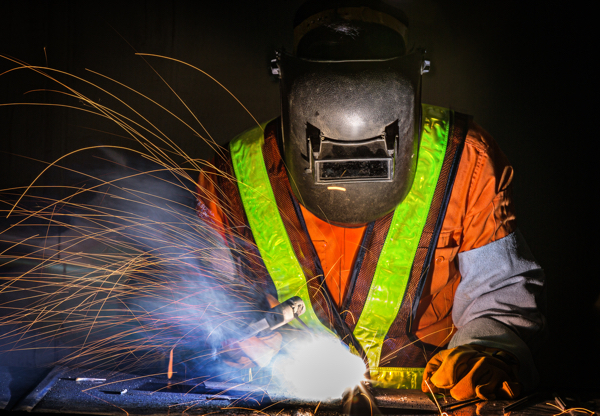 There are several key reasons why it's important to preheat before welding. First, a preheated part cools more slowly, which slows the overall cooling rate of the welded part. This improves the metallurgical (crystalline) structure and makes it less prone to cracking. Additionally, hydrogen that may be present immediately after a weld is also released more efficiently, which further reduces the possibility cracking. Preheating also mitigates stress from the shrinkage at the weld joint and nearby metal. Finally, pre-heating reduces the possibility of fracture during fabrication due to brittleness. Welding code is the first determinant to whether pre-heating is needed. Welding code carefully specifies the minimum preheat temperature, the soak time, and the welding process. Many criteria are considered by welding codes, all gathered from years of rigorously tested data. This data is accumulated from many sources, including metallurgical science, chemical properties of materials, and radiographic analysis. Determining whether or not preheating is required should not be taken lightly, as it is critical to the quality of a weld and therefore critical to the performance of a structure. When in doubt, review of industry code or contacting an industry expert, is imperative.